The notebooks are thin and bound with string. Some have hard covers, brown and marbled; others are covered with thick, blue paper, faded and brittle. Inside, cursive handwriting in black ink fills the blue-lined paper. The notebooks date from 1880 through 1889; it is a wonder they have survived this long. But their content is even more incredible: hundreds of pages describing the natural and human environment of Mount Desert Island as viewed through the eyes of college students. The notes were written by the Champlain Society, a group of young men from Harvard who spent their summers on the island, studying plants, birds, insects, fish, geology, hydrology, and meteorology. Led by their “Captain” Charles Eliot, son of Harvard President Charles William Eliot (convention includes the middle initial, “W,” in the name of the father to distinguish the two), the Champlain Society conducted the first natural history surveys of Mount Desert Island. Though they were not the first scientists to come here, they were the first to spend extended periods of time, engaging deeply in this place. They also have a direct connection to the creation of what would become Acadia National Park. In partnership with the Northeast Harbor Library and the Maine Historical Society, we have been working to digitize and transcribe the notebooks, a gift of the Eliot family to the Mount Desert Island Historical Society. The collection includes logbooks from the Champlain Society’s encampments. They spent the summer of 1880 and 1881 camping in canvas tents in Asa Smallidge’s field on the shore of Somes Sound near the outlet of Hadlock Brook (“Camp Pemetic”). In 1882 they moved to the Savage property at the head of Northeast Harbor (“Camp Asticou”). Yacht logs detail excursions made in the Eliots’ sailboat, Sunshine. The Champlain Society members took themselves seriously. An organized club, they kept records of their meetings during the winter months at Harvard. Each scientific “department” submitted reports of their findings. There is also an exceptional compilation of Charles Eliot’s notes on the history of Mount Desert Island. After the moon rose all hands abandoned the tent and watched the sky. The dark, deep, cold, spaces between the broken patches of drifting clouds, the white and radiant clouds themselves, and the brilliant bursts of light with which the moon surprised us now and then, made a very beautiful sight. While this beautiful scene continued the fellows stood about, and once in a while a song of the gentle kind was raised; but after about half an hour the clouds became very thick again, and reading and writing in the tent were again resorted to. From their notes, we can trace their movements across the island as they collected specimens, made observations, and talked to local residents about place names and legends. They provide an entertaining and at times hilarious window into the social life of Rusticators. We know the hills they summited and the trails they used; their sketches became some of the first published maps of Mount Desert Island. Their science is valid and valuable—researchers today are using their data to assess how the island has changed over the last century. But we are motivated by another aspect of their story. As far as we know, the Champlain Society, especially members Charles Eliot and Edward Lothrup Rand, were the first people to call for protection of the Mount Desert Island landscape. 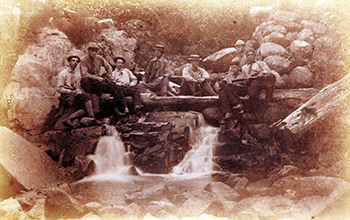 Twenty-three-year-old Charles Eliot wrote in his personal diary in 1883, “The scenery of Mount Desert is so beautiful and remarkable that no pains should be spared to save it from injury—to the end that many generations may receive all possible benefit and enjoyment from the sight of it.” Eliot brought his concerns to his club, who took up his cause and expressed their vision in their notes. And Eliot continued to think about how to protect the island as he went on to apprentice with Frederick Law Olmsted and become a landscape architect. Charles Eliot helped create The Trustees of Reservations in Massachusetts in 1891. Six years later, at the age of 37, he died of spinal meningitis. Committed to carrying on his son’s legacy, Charles W. Eliot used The Trustees of Reservations as a model when, inspired by his son’s vision, he worked with George Dorr to form the Hancock County Trustees of Public Reservations and acquire the first land holdings that eventually became Acadia National Park. 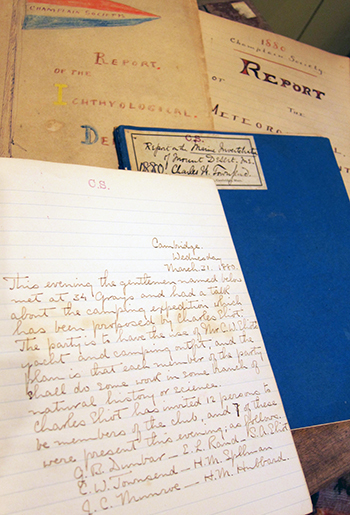 Thus the origins of Acadia can be found in the fragile journals of young scientists dia,” says Acadia’s science coordinator, studying the island environment in the 1880s. And these naturalists helped to show the importance of protecting the island’s diverse flora and fauna for science. For Dorr, the history of scientific work on the island foretold the island’s scientific future. There is no greater evidence for the stimulating change effected by time spent in Acadia than the Champlain Society notebooks and the cadre of students, researchers, and volunteer citizen-scientists who continue that work today. In sharing the Champlain Society’s story, we have found that it resonates with audiences of all ages and backgrounds, making science interesting and engaging even to non-scientists. The Champlain Society also offers a fresh look at Acadia’s past. “One of the great promises of the digital age is that invaluable historical materials, heretofore hidden or inaccessible, will now be brought into public light, where they can be appreciated, and where they can contribute to our understanding of history,” says Tim Garrity. Our work continues. To date, six of the original logbooks have been scanned and submitted for online access. Anyone can now accompany the Champlain Society members as they explore, study, and camp on Mount Desert Island. Read their words with gratitude for their legacy: the conservation of lands that became Acadia National Park. MAUREEN FOURNIER lives in Somesville with her husband, Gerry, and is a seasonal ranger in Acadia National Park. She volunteers for the Mount Desert Island Historical Society during the winter months. CATHERINE SCHMITT lives in Bangor and is the author of A Coastal Companion: A Year in the Gulf of Maine from Cape Cod to Canada. To access the online Champlain Society logbooks on Maine Memory Network, search www.mainememory.net and type “Champlain Society” in the search box. You will then view all of the “historical items” which lists the digital versions of the logbooks as well as their corrsponding transcriptions. Check back in late spring for additional logbooks to be available.